The Space Between, a tale of love and loss set amongst the beautiful region of Friuli Venezia Giulia in North East Italy, is a film that has made a significant mark on the Australian film industry being the first Australian-Italian co-production and the debut feature film for writer and director Ruth Borgobello. This film is very close to Borgobello’s heart as it’s inspired by her own journey as an Australian-Italian discovering her heritage and finding the courage to pursue her hidden dreams, mirrored by and co-created with her new found Italian soul mate on his own journey of discovery. The story starts prominent Italian actor, Flavio Parenti and Australian actress, Maeve Dermody, and revolves around Marco (Parenti), a 35 year-old ex-chef who has given up on his career in order to return to Udine in Northern Italy to nurse his ailing father, even when offered a job in Melbourne at Italian restaurant Café Di Stasio. The only glimmer of joy arrives in the form of Olivia (Dermody), a spirited Australian chasing her dream of working in design while on a family mission in Udine. Against the vineyard peppered countryside, jagged mountainscape and electric blue Adriatic Sea, these two very different people find themselves at a crossroads that will change their lives forever. The film will exclusively show for one week only from 20 July 2017 at Nova and Palace Cinemas and ahead of the Australian theatrical release, we caught up with Ruth to talk about the inspiration behind this film and what it’s like to work in the Australian film industry. The Space Between is the feature length directorial debut for you. What inspired you to write this film? The film was inspired by the moment I met my husband, Davide during my first trip to Italy to my Father’s hometown of Gorizia. The very same day we met, Davide lost someone very close to him in a tragic accident. This moment always stayed with me – the strange intersection between love and loss and the birth of a new relationship right at that moment of losing someone so important. The inspiration evolved into wanting to explore this moment in the context of Italy today and what it means to be in your thirties and at a cross roads between the choices of the past and an uncertain future. The film has been very well received globally. What has it been like since the film was launched and how have you felt to receive such accolades and positive reviews? It’s been an incredible experience to create a truly international film and watch it resonate with different audiences from Italy and Australia to Canada (where is recently screened at the Italian Contemporary Film Festival) and beyond. More than reviews or accolades, the most important thing for me is that the film really connects to the audience and its been great to see the film resonate so deeply across different countries. In Italy in particular, there were lots of tears and hugs from audience members after the screenings and many beautiful, heartfelt messages that arrived in the days after. A few people even wrote to us to say the film had inspired them to quit their jobs and follow their dreams – quite a responsibility! It seemed cathartic for audiences in Italy, which was really touching. In Toronto, we had our largest screenings so far and a couple even drove from Chicago just because they loved the trailer. It was pretty special to get such a positive reaction outside of the two home countries and inspiring to keep going on this path. 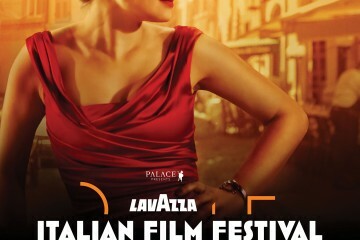 The Space Between was filmed in Italy and represents the first Australian Italian co production since a treaty was signed in 1996. Why do you think it took so long for a film to be made between the two countries? I could write a book on this! I think essentially, it’s the deep differences in culture, filmmaking and language that have made it so difficult. There is a very different approach to putting together finance in Italy to Australia and much more flexibility when it comes to government funding. It was really a minefield to try to put together the puzzle to make it all fit but I think essentially it came down to a great willingness between our co-producers and the fact that Davide, the Australian producer is actually Italian born and bred so he could effectively navigate the differences and transform them into strengths. How much of your heritage has shaped how you approached the film? I think the film in many ways is really a hybrid between Italy and Australia that reflects my own personality and background. Some of the Australians from the Embassy in Rome that came to see the film when it premiered in Italy felt the film is very very unique in capturing the sensibilities of the two countries. This has come both from the directorial approach but also from the cross pollination of Australian and Italians in the cast and crew. I was very influenced by Italian cinema in the approach to the film but also wanted to bring a kind of Australian openness and spiritedness to it. I think more than anything though, it was the locations and characters that shaped my approach to the film – in trying to capture their pulse and truth. What was it like to film in Italy? Crazy, joyful, frustrating, inspiring – a rollercoaster of emotions! Italy is very seductive in giving you the best of itself when it comes to locations, light and incredible character nuances. But it is also unpredictable and temperamental which means you need to stay very calm and ride the waves. I am very thankful to have worked with Katie Milwright (an Aussie cinematographer) on this as she made the ride much smoother. But I also really loved the process of casting and working with Italian actors and creative talent. The joy and passion that comes out in the process of working is energising and deeply creative. We also got to have all our meetings over beautiful glasses of wine and local produce, which wasn’t too bad at all! Italians have this great sense of balance and ability to stay in the present moment which I learnt a lot from. As one of few Australian female directors in Film, what advice do you have for those looking to make their start in the business? Do you have any reflections or tips on what has helped you succeed in your career so far? I honestly think it’s best not to think too much about it. Surround yourself with people that believe in you and that you love working with and share the journey with them. Collaboration is the best thing about filmmaking so I think it’s the relationships you foster that make it all worthwhile and help you build a career. I also think it’s a great moment for female directors as there’s a real hunger for female stories. In Australia, the biggest audience is women so its time for the system – whether it be distributors, funding organisations or other decision makers, to support the telling women’s stories by women. For me, I think it was an advantage in a way, to be an Australian woman embarking on a film in Italy – it made me an anomaly that attracted interest. It’s only now that you see the statistics that I really started to see the bias that does really exist. I think it’s still there when it comes to festivals and release plans but we have to keep fighting to overcome it. Q&A with Ruth, Producer Davide Giusto and Cinematographer Katie Milwright that will take place at Cinema Nova tonight at 6.30pm and the Q&A in Sydney with Ruth & Davide at Palace Norton Street Cinema on Tuesday 25th July at 6.00pm. The film will exclusively show for one week only at Nova and Palace Cinemas with Alfa Romeo Australia as the official presenting partner from 20 July, 2017. Visit Palace Cinemas at for session times.